There are many different forms of exercise; however, one of the most popular forms is biking. People can take a bike anywhere. This includes on the road, through trails, and even mountain biking. 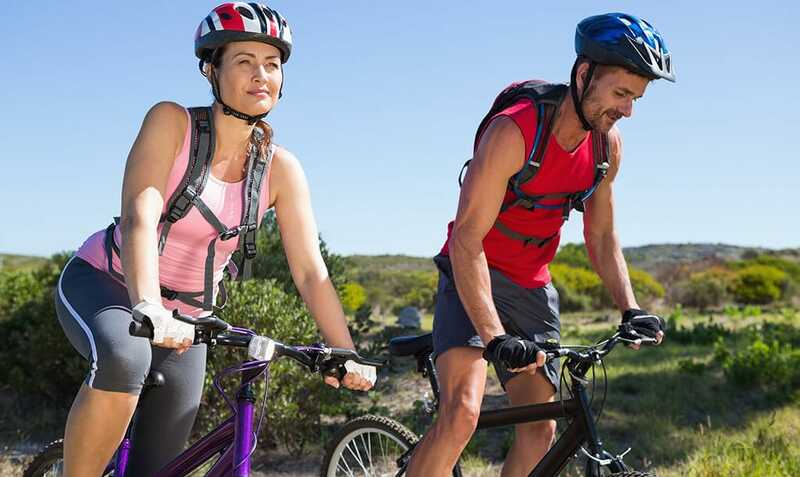 Unlike other forms of exercise, biking does not place as much stress on the joints, allowing people to preserve the cartilage in their knees as they bike over the years. This is a great form of cardiac exercise, which can help with weight loss, in addition to building strength in the legs and the core. With this in mind, there are lots of people who have taken up biking; however, existing cyclists are also wondering how they can get better at biking. This could include improving balance, handling hills better, or simply biking further and faster. As people improve their biking, they will be able to improve the quality of their workout routine. What are some of the ways that people can improve their biking? One of the ways that people can improve their biking skills is by biking faster. Yes, it is hard for people to tell how fast they are riding on the road; however, everyone can take the corners faster. Often, people decelerate as they approach a corner in an effort to shorten the distance. While this sounds like a good idea, it is actually how much speed people carry through corners that matters. As people carry speed through their corners, they are able to conserve energy because they do not have to accelerate when they leave that corner. Therefore, try to practice this on the next ride. Treat every corner like a practice round and improve the overall speed on the next ride. It is hard for people to ride well when their bike is uncomfortable. One of the easiest ways to improve the comfort on the bike is to adjust the height of the saddle. Even though it can be annoying to adjust the height of the seat, it is very important for keeping the muscles comfortable. When the saddle is not at the right height, people stress their core and their bike in unnecessary ways. Therefore, try to make sure that the saddle is comfortable. Try to ride a few times at different heights and experiment. If your bike is extremely sore at the end of the ride, it could be the height of the saddle. It can be difficult to fit a large number of rides into a single week. Everyone has to go to work, school, or maybe the weather just isn’t right. On the occasions when people can get outside, it is vital to try to bike on different terrain. The pavement presents a different challenge than a trail through the woods. The changes in elevation on the mountain trails are different than biking through a city. As the terrain changes, the challenges will change as well. This is how people can build up their repertoire while also testing out different muscle groups. Take the time to try out different types of terrain. This will lead to improved skills on the bike. After a big bike ride, many people are starving. They are looking for anything that will satiate their appetite. On the other hand, it is important to also think about what is going into the body. As people bike, they are going to stress their muscles to the limits. Their muscles need the proper nutrition to recover. In order to do this, find sources of protein, which contain the amino acids that are necessary to rebuild damaged muscle fibers. Before a bike ride, make sure to take in plenty of carbohydrates. This will provide the body with the glucose stores that are needed to power the muscles. Finally, make sure that the body stays properly hydrated. Dehydration is a tremendous drain on the body and can make a bike ride pure torture. Replace water and electrolytes during the ride. There are significant logistical challenges that come with trying to add miles to a bike ride. Some people may not have the time to ride long distances. Other people could be worried about how their bike is going to hold up. Some people could be worried about getting lost. In order to get better at biking, the endurance must be tested. In order to do this, try to add miles to bike rides. This will build up the endurance of the heart, the muscles, and the mind. People may not think that they are able to ride those distances; however, people will be surprised at how far they can push their body. Don’t be afraid to tackle those long road trips. Just make sure to bring plenty of fluids and a map! Ultimately, one of the best ways to push the body is to do it with some company. When people ride with other roadies, they can tackle almost any adventure. Having someone to talk to will make the miles go by quicker. When someone starts to lag, it is important to have that encouragement to stick with it. Most people would love to talk to other people while they ride instead of having to focus on the wheel spinning on the pavement. In addition, having other people around is a must if people suffer an equipment malfunction or get hurt while riding. Finally, try to find people who are going to help push you to become the type of rider you would like to be. Without a doubt, the most proven way to improve their biking is to add miles; however, it is also important for everyone to take the time to improve the quality of their biking as well. To do this, consider incorporating some of the tips above. In addition, it can be helpful to strengthen other muscle groups as well by taking the bike on hills, trails, and the road. As people take steps to improve their biking, they should start to notice a difference. This could include biking further than before, biking faster than before, and handling a diverse array of terrain. While this payoff might not be evident immediately, people need to remember to stick with it. As people stick with their biking routine over weeks and months, they should start to notice a difference. So, get out there and put the rubber to the road!